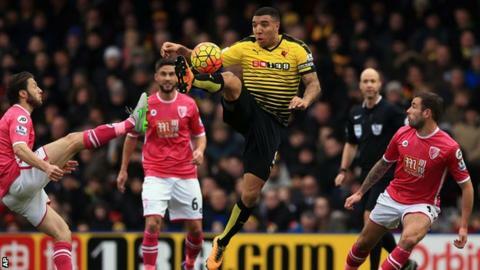 Watford and Bournemouth both missed good chances as their contest at Vicarage Road finished goalless. Hornets' striker Odion Ighalo had the best of those opportunities when his header from eight yards sailed over the bar. He also fired over the bar from 12 yards from a quick free-kick, and forced Artur Boruc into an early save. The Cherries went close through Max Gradel, who made his first appearance since a ligament injury in August. Hornets in a mid-table slumber? They have 37 points and might only need about 42 to secure Premier League survival. So with a estimated £100m guaranteed for retaining top-flight status, you cannot blame Quique Sanchez Flores' men for appearing to drop down a gear. Nevertheless, there is pride at stake, and for Ighalo, the honour of finishing as the division's top scorer. The Nigerian has 14 goals - five goals fewer than Leicester's Jamie Vardy - but has not found the net only once in the league since 28 December. Had the 26-year-old been at his sharpest he would have scored inside the first minute instead of firing at Boruc. He also headed over inexplicably in the second half and then again missed the target after Ben Watson's quick thinking from a free-kick gave him another good opportunity. When will his rotten run come to an end? Flores will no doubt think his side should have won the match, but so will counterpart Eddie Howe. Gradel, who came on for the injured Junior Stanislas in the 21st minute, had a header and looping shot saved by Gomes. The Brazilian keeper then made a fantastic stop to prevent Harry Arter's swerving shot from bursting the net. One incident that is certain to be discussed was the handball by Watford's Valon Behrami from a corner. Intentional? Referee Anthony Taylor did not think so. The point moves Bournemouth further away from the bottom three. Aside from good forward play, the defence limited Watford to few clear-cut chances. Repeat all-round displays should see them safe. "We should have won. We were excellent in long spells of the game. But it's a clean sheet and a point. "When you don't win it's important to get a point. We are closer to the 40-point mark. Watford are at Manchester United on Wednesday 2 March, and Bournemouth host south coast rivals Southampton a day earlier. Match ends, Watford 0, Bournemouth 0. Second Half ends, Watford 0, Bournemouth 0. Attempt missed. Valon Behrami (Watford) right footed shot from outside the box is close, but misses to the right following a set piece situation. Attempt saved. Max Gradel (Bournemouth) right footed shot from the centre of the box is saved in the top centre of the goal. Max Gradel (Bournemouth) wins a free kick on the left wing. Substitution, Bournemouth. Glenn Murray replaces Matt Ritchie. Substitution, Watford. Almen Abdi replaces Nordin Amrabat. Delay in match Matt Ritchie (Bournemouth) because of an injury. Attempt missed. Harry Arter (Bournemouth) left footed shot from outside the box is high and wide to the left. Assisted by Dan Gosling. Attempt saved. Max Gradel (Bournemouth) header from the centre of the box is saved in the centre of the goal. Assisted by Joshua King with a cross. Max Gradel (Bournemouth) wins a free kick in the attacking half. Attempt missed. Odion Ighalo (Watford) right footed shot from the left side of the box is high and wide to the right. Assisted by Ben Watson following a set piece situation. Nordin Amrabat (Watford) wins a free kick on the left wing. Attempt missed. Miguel Britos (Watford) left footed shot from the centre of the box is close, but misses to the left. Assisted by Ben Watson with a cross following a set piece situation. Valon Behrami (Watford) wins a free kick on the left wing. Substitution, Bournemouth. Dan Gosling replaces Benik Afobe.